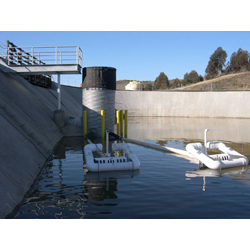 Skimmer surface drains meet BMP requirements for sediment basins. They float on the surface of the basin, releasing the cleanest water near the surface instead of draining muddy water from the bottom. These products drain the basin slowly over several days at a constant rate to maximize settling. The adjustable orifice regulates filling and drawdown of the basin to improve efficiency. Eight sizes are available.